Story: There are certain moments in history when America has proven itself to the world: Neil Armstrong setting foot on the Moon; or the US Men's Hockey team beating the Soviet Union in the 1980 Olympics. One such moment, however, never got the recognition it deserved: In 1976, a small American winery bested the exalted French wines of the time and sent the wine industry into a tizzy - putting California wines on the map for good. 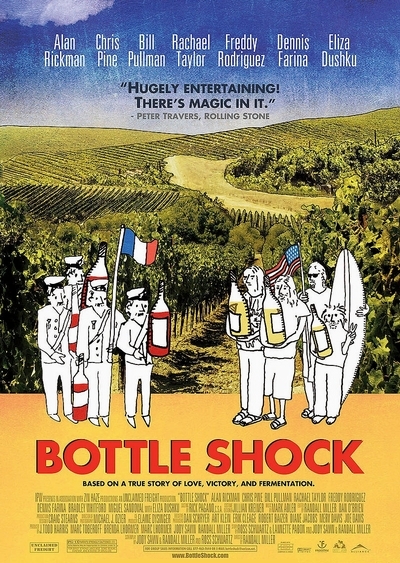 Based on a true story, Bottle Shock chronicles the events leading up to the famous 'Judgment of Paris' tastings, told through the lives of father and son, Jim and Bo Barrett. A former real estate attorney, Jim (Bill Pullman) sacrificed everything to realize his dream of creating the perfect hand-crafted chardonnay. His business, however, is struggling, and he's not only trying to overcome differences with his slacker son (Chris Pine), but is also fighting off the creditors. Meanwhile in Paris, unwitting British wine shop owner Steven Spurrier (Alan Rickman) hopes to revive his own failing business by sponsoring a competition which will pit the traditional French powerhouse against the California upstarts. Little did Steven and Jim realize that they were both on course to change the history of wine forever.